Saunders is a huge political artist. Her work deals with the overpowering and injustice leaders of our society. Her artwork makes the political leaders look silly, irrational, and dangerous by their facial expressions and crazy actions. 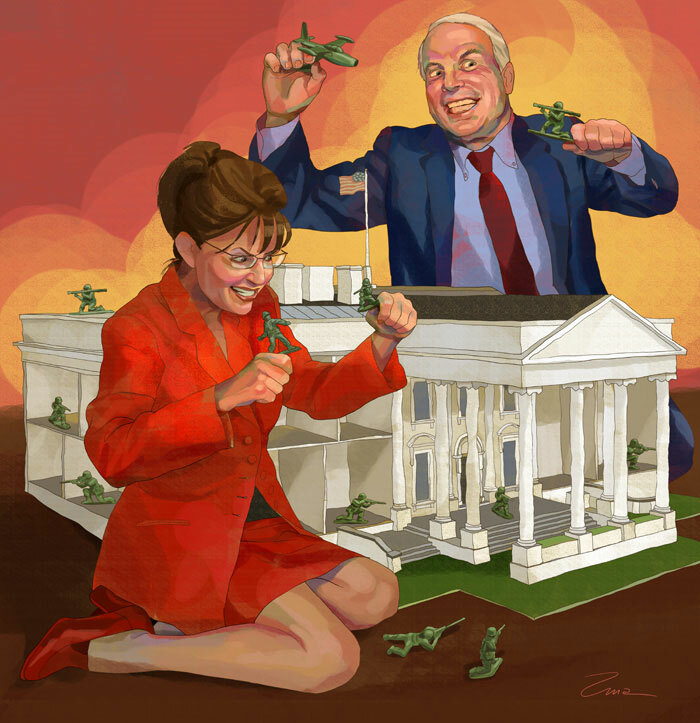 Another example of her work is below with a depiction of Mccain telling scary stories of Obama. Saunders is sending a big message to the viewer about each leader. Mccain has an evil glow about him, and he is obviously talking smack about the President and scaring little kids in the process. 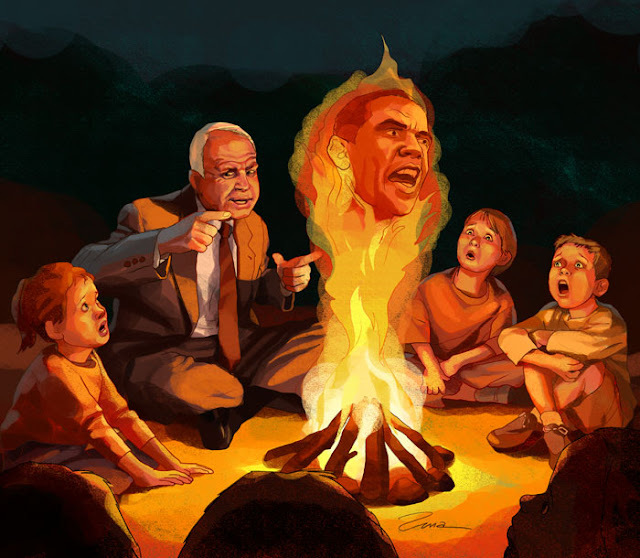 Obama also appears unpleasant and devilish as the flames engulf him. There is also a message about how our future of America will be after Obama has been in office. She is suggesting that younger generations will be told of the horrific past caused by the mess ups of the nations political leaders. It is typical to find social art in the midst of street art due to the discreetness of the artist. When the artist is unknown, the artists is given more freedom to express disputable subjects. Banksy was one of the unknown street artists until he came out to the public in 2007. Many of his topics concern war and peace, and how the government is not helping. 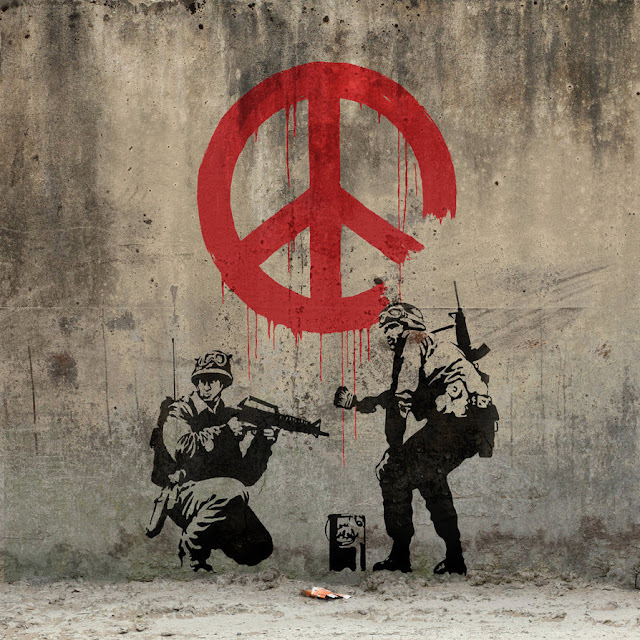 Banksy's choice of soldiers with machine guns painting a peace sign is alarming to any American citizen. Many questions arise from his artwork, which inspires viewers to take a deeper look into politics and search for the truth. Artwork like this calls viewers to not believe everything the government says, which is a good message to get out to the public every once in awhile. A huge scandal still active in the United States is the debate over what happened on 9/11. Many people believe it was all a scam, and their ideas are spread and supported by social artwork like the one above. Arroyo's goal in her work was to stir up questions in the viewers mind concerning 9/11. Obviously Arroyo is skeptical on what took place and wants others to hesitate before trusting all the government says. Political and social art has been on the up-rise due to recent wars, scandals, and debates. As an individual in the society, an artist has the ability to share ideas of doubt and concern about what is happening in the world through their creations. Artwork such as these are important to keep the government and political leaders on their toes and also to remind the public that not everything we hear in the news is true.